Australia's batsmen have been too defensive (l-R) Marcus Stoinis, Travis Head, Aaron Finch, Chris Lynn and Alex Carey. AUSTRALIA has been touted as a nation of fearless hitters, but in fact they've been exposed as too timid for their own good. Damning statistics have spotlighted the crisis of confidence that has gripped Australia's white ball batting ranks heading into Saturday night's one-off Twenty20 international against South Africa on the Gold Coast. Detailed analysis from CricViz reveals how the embattled top order is second-guessing themselves at the crease and are being dogged by the fact batsmen have no second or third gear. 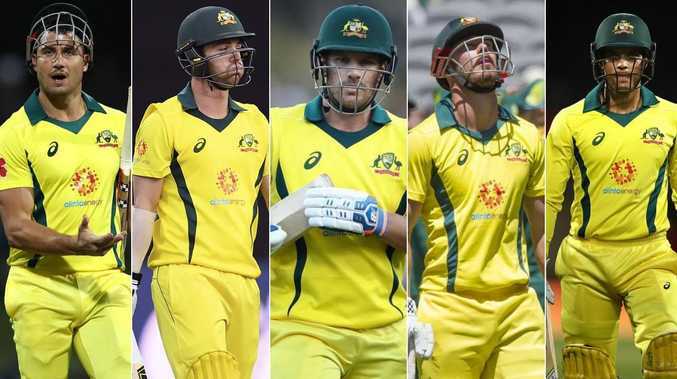 Attacking weapons Aaron Finch, Chris Lynn, Marcus Stoinis, Alex Carey, D'Arcy Short and Glenn Maxwell will all transition from ODI cricket to the T20s tonight and must shake off chastening criticism from within their own camp that they're "one-dimensional." India is due to arrive in Brisbane on Saturday and Lynn and company are under mounting pressure to cut loose and play their natural games in the looming T20 matches or risk expulsion from Australia's World Cup plans. In the first 20 overs of Australia's last-start ODI series loss to South Africa in Hobart, 45 per cent of all shots from the batsmen were defensive, the most an Australian outfit has ever played in that period of an ODI since records began. Given Australia's ODI selection policy has centred around picking T20-focused batting cannons, the fact players are trying to change on the run to a more moderate approach points to muddled minds. Lynn admits Australia must come out swinging on the Gold Coast if they're to rediscover their lost self-belief. "First and foremost we need to be out there throwing the first punch and putting them on the back foot," said Lynn. "I guess (confidence might have been down) because we didn't get off to the greatest starts (in the one-dayers) so hopefully we can do that tonight. "I suppose we were always just chasing the game rather than driving the game. "If you drive the game it makes life so much easier, not only for the batting group but for your captain, for your bowlers. We'll see what happens. "You don't get better overnight I believe so it's going to take a while to adjust but the change room is happy and we're working our arses off." Despite their attempts to play more defensively, not one of Australia's top order ODI batsmen is capable of effectively rotating the strike. Fox Cricket expert Kerry O'Keeffe has declared Australia's batting is almost devoid of "rhythm", a statement backed up by the fact the likes of Stoinis and Travis Head can get bogged down with dot balls and no Australian batsman plays more rotating shots than attacking shots, according to CricVis. Those numbers suggest mass changes could be made to the ODI side to inject players such as Steve Smith, David Warner, Usman Khawaja and Peter Handscomb, who are all capable of rotating strike and providing rhythm to an innings. "I'm a dinosaur. I like the Mike Hussey-type player. And that's what we're searching for," O'Keeffe said. Faf du Plessis says the Aussies are a lot quieter now. 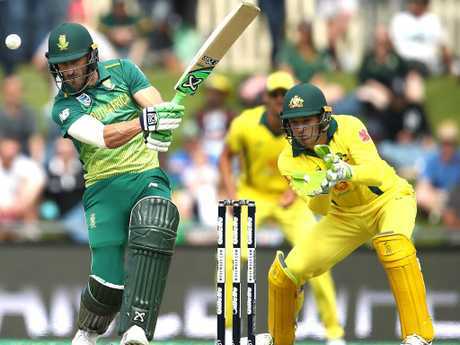 South African series-winner Faf du Plessis was the most impressive batter in either team, yet he rotates strike with 41 per cent of the balls he faces and only attacks on 39. In T20 cricket the likes of Finch, Lynn, Stoinis, Maxwell, Carey and Short all play more attacking shots than the world average, but in the recent ODI series only Maxwell stayed above the line, with the rest altering their approach. Lynn insists he isn't panicking. "I actually don't think I'll change at all to be honest. 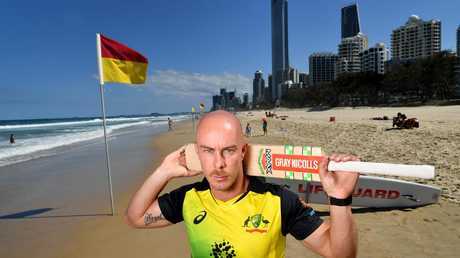 I feel like I'm hitting the ball quite well," the Queenslander said. "Obviously the runs haven't been there but just because you miss out on a couple of innings you don't change your whole game plan. "For me it's just about keeping my head still and hitting through the line of the ball and I'm going to try and do that to the best of my ability. "You're going to come off some nights and others you're going to fail, that's just the way it goes in the shorter formats, hopefully the luck of the bounce goes my way." Every Test, ODI, T20I, and BBL match live & ad-break free during play. SIGN UP TODAY!